Today is a good day to reach out to someone who needs a helping hand and show them how much you care. 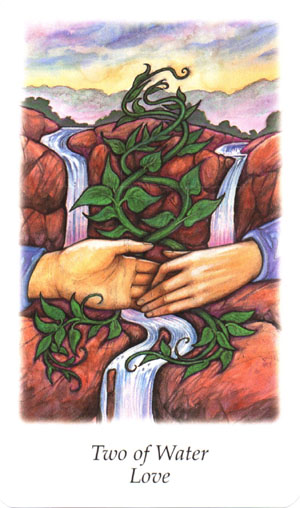 The Two of Water is the Vision Quest Tarot’s version of the Two of Cups, a card most often associated with a mutual attraction, love at first sight and the initial stages of falling in love. It’s called “Love” in this deck and the hands that are joined together — one male and one female — are reminiscent of that very ideal. In addition to the pair of hands, there are two flowing streams and two sets of vines, both of which join together to become one. 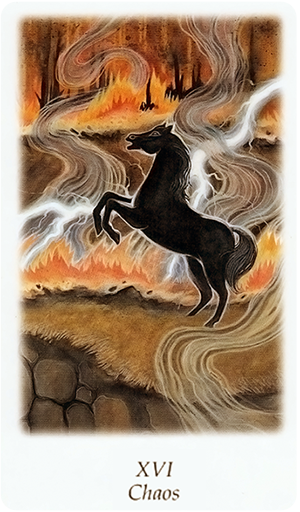 Bonds are created throughout the imagery in this card, all merging together in perfect harmony. The Two of Water seems to be as much about coming together and supporting one another as it does the romanticized idyllic version of love. And we know that love takes on many forms and is experienced in a multitude of ways. It’s the process of falling in love that reveals to us ourselves at our very best. It’s where we put our best version of ourselves forward and the Universe responds by opening up unanticipated doors. The Two of Water can refer to that love at first sight sense of finding your other half. 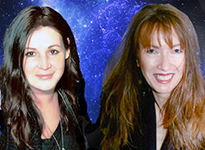 It’s the mutual attraction card, the soulmate card, and so much more. It’s the process of falling in love or renewing a love connection that replenishes itself over time. If you meet someone new today consider it an opportunity for growth. It could be the yin to your yang — or it could just be a friend who shows you the true meaning of the word. You may also be working on revamping your current connection or reuniting with a loved one. Whichever it is, be grateful for the opportunity to see yourself through someone else’s eyes. As Pluto turns direct today (after five long months in retrograde motion), you may be thinking about closing the door on one chapter in your life and opening another. Today’s Saturn / Jupiter square may force you to look at where you’ve been beating a dead horse in certain areas of your life. You may be questioning whether something is worth putting more effort and energy into — such as a job, a relationship, or a business venture that’s not paying off. — or whether it’s time to throw in the towel. 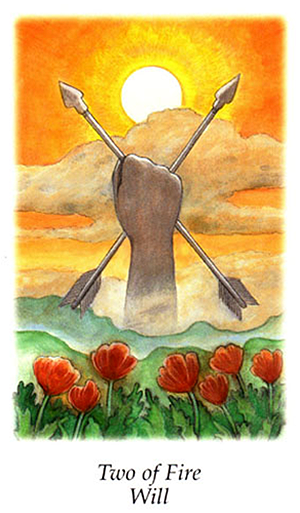 The Oppression card — Vision Quest Tarot’s version of the Ten of Wands — answers this question in a multitude of ways. The Sun is setting, the embers are dying down and the dear’s carcass has been picked clean. 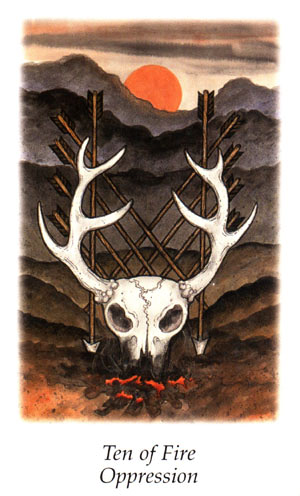 Even the Ten Wands (arrows in this card) are lined up and crossing one another in a ceremonial formation, signifying defeat. The Jupiter / Saturn square can put a damper on your plans but if so you can bet they weren’t as well-laid as you thought. The Jupiter portion of this configuration may have relied too much on faith, while the Saturn portion serves as a wake up call. In this respect, today’s Jupiter / Saturn reality check may be a blessing in disguise. The weight of responsibilities you’ve taken on may seem like a heavy load — too heavy in fact for just one person to carry. 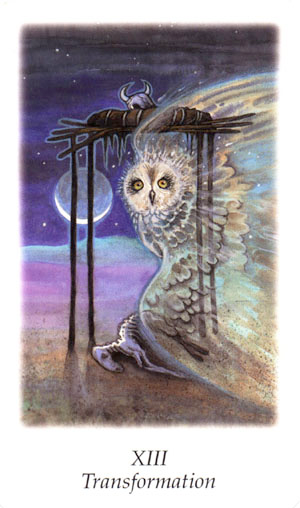 The Ten of Wands says it’s time to lighten your load. Get rid of what is no longer worth holding onto, and work on salvaging what’s left. Today is a good day to be thinking about your future, especially with respect to your security and financial stability. The Wealth card — the Vision Quest Tarot’s version of the Ten of Pentacles — is about building your empire, on whatever scale that might be. It’s about achieving success through hard work and determination, as well as the satisfaction that comes with knowing that it’s all going to pay off in the end. Not just for you but for family and loved ones, as this card is also about creating a legacy that can be built on for generations to come. 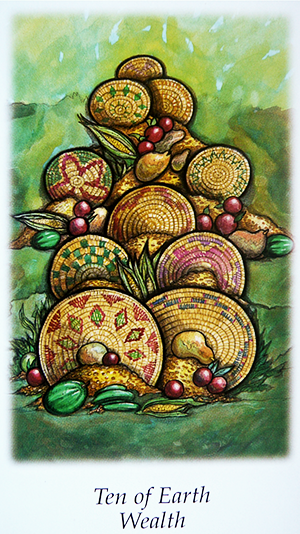 The “pentacles” in this version are ten intricately woven baskets, displayed alongside a bountiful harvest of summer fruits and winter vegetables. These are seen as a reminder of the importance of both appreciating what you have now and planning toward the future. The greens and golds so prominent in this card are also significant. These are the colors associated with wealth, prosperity and abundance. Notice how the baskets are fashioned in the shape of a human form, lifted up on plentiful hills of grain — the earth’s most sustainable resource. The Ten of Pentacles is about establishing a lasting legacy for yourself and your loved ones. It’s about enjoying and appreciating what you have while planning ahead for the future. No matter how successful you are there’s always more to be done, especially as it pertains to creating something that will live on long after you’re gone. You may be thinking of starting a family or putting money aside for children you already have. You could also be in the process of giving birth to something else — a business, a creative endeavor or a body of work. Whatever it is, know that this is something you want to be proud of, so put the extra energy into making sure you do it right.